Being back in Pennsylvania doesn’t mean that I’ve seen the last of JOY. A week ago I went back to Ridge Soaring Gliderport on a fantastic looking day. Mike and I reassembled the Nimbus-3DM and headed out on a flight to points west (see flight track here). A nearly 300-kilometer flight is pretty nice, but we were hoping for even better, intending to fly around 50 miles further west and catch Lyle flying in N824T. We started too late, though, and the day got soft. On the bright side, we mounted the camera way, way out on the left wingtip. 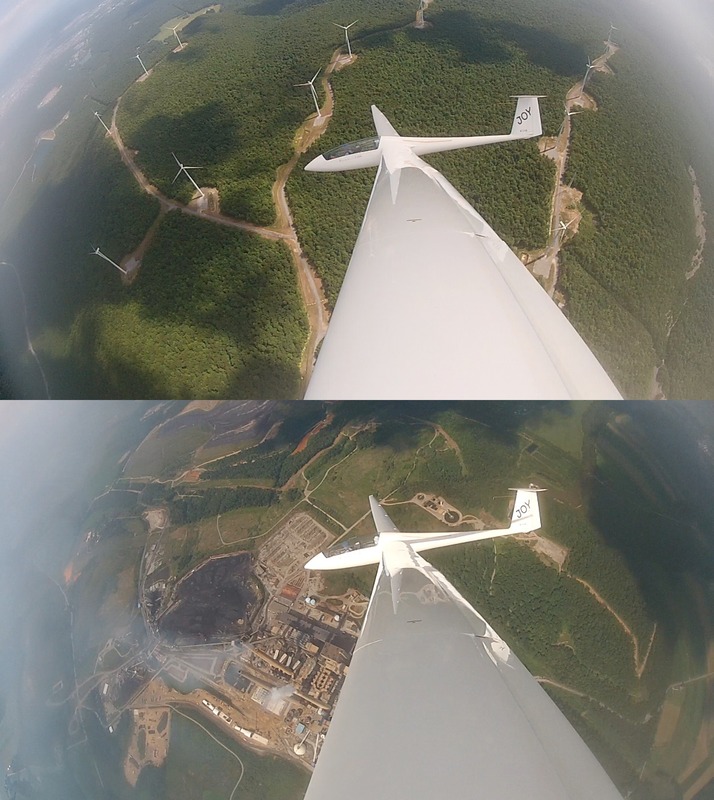 The photo above shows us over a windfarm near Altoona, and then up over the Homer City stacks after that. While we’re thermaling over Homer City, we can claim semi-legitimately to be flying a coal-powered airplane. In France, where nuclear generating stations are much more common, the skies are presumably flocked with atomic-powered planes. It’s the entire flight—all three hours, twenty minutes of it—in 1080P high definition video! You are encouraged to skip around. After a while, the camera case had some condensation built up inside, but things are still fairly visible. Can’t get enough soaring even after that? The great news is that the 2012 World Gliding Championships are here! By here I mean “happening now” and “in the United States”, specifically Uvalde, Texas. A locally-hosted international contest featuring the best-of-the-best pilots and the newest, most exotic gliders (1, 2, 3, etc.) would be the perfect opportunity to introduce this amazing sport to a whole new audience! So why on earth did they schedule it during the Olympic Games??! Who’s going to pay attention to a sport that’s impossible to televise when the world’s best athletes are on TV around the clock? I never went to marketing school or whatever, but this seems like a pretty elementary mistake. Couldn’t the Worlds have waited two more weeks? Surely there was debate over this—careful weighing of the pros and cons. I’d love to know the reasons. Posted on 2012/08/05 by tom. This entry was posted in Soaring. Bookmark the permalink.